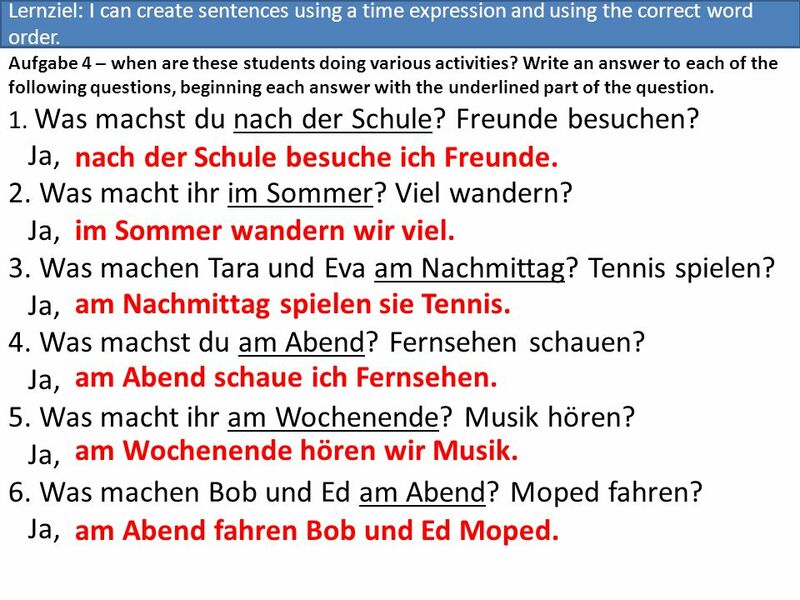 3 Lernziel: I can create sentences using a time expression and using the correct word order. 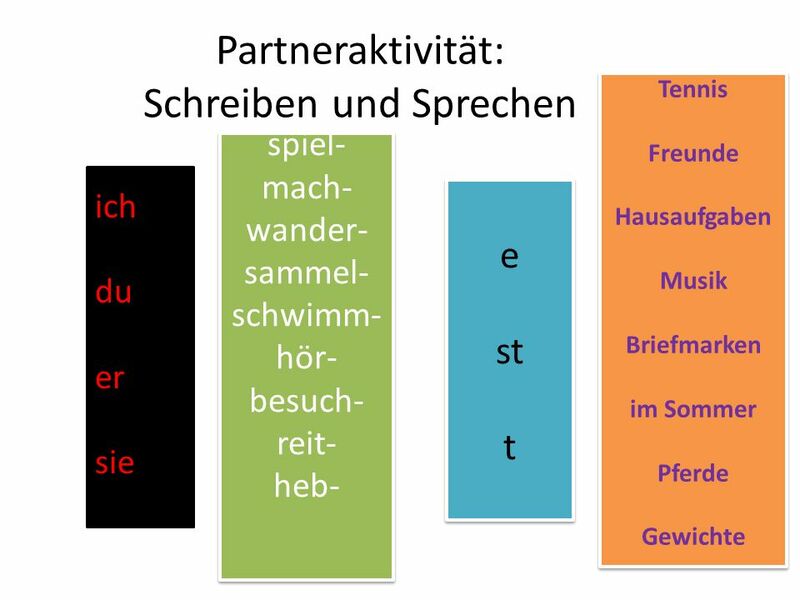 4 Shakespeare once wrote: “Now go we in content” in As you like it Now, this might sound a little odd to you, but this is how Germans speak. Can you “Shakespeare” it? Where is the Verb? Before or after the subject? 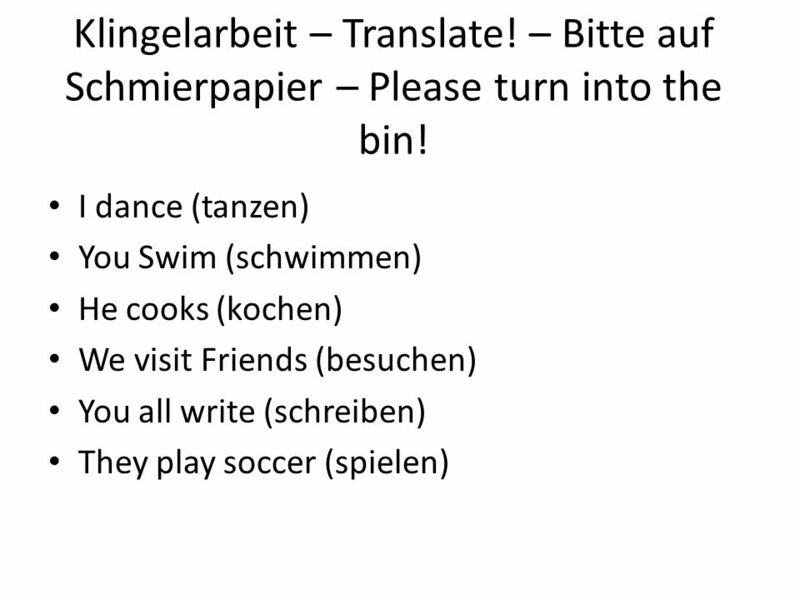 Englisch: In the fall I play soccer. Shakespeare: In the fall play I soccer. 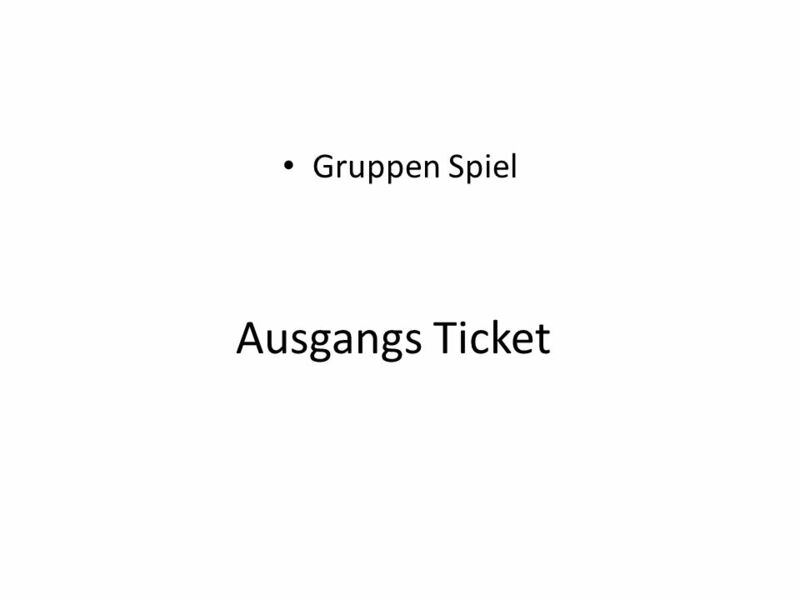 Deutsch: Im Herbst spiele ich Fußball. 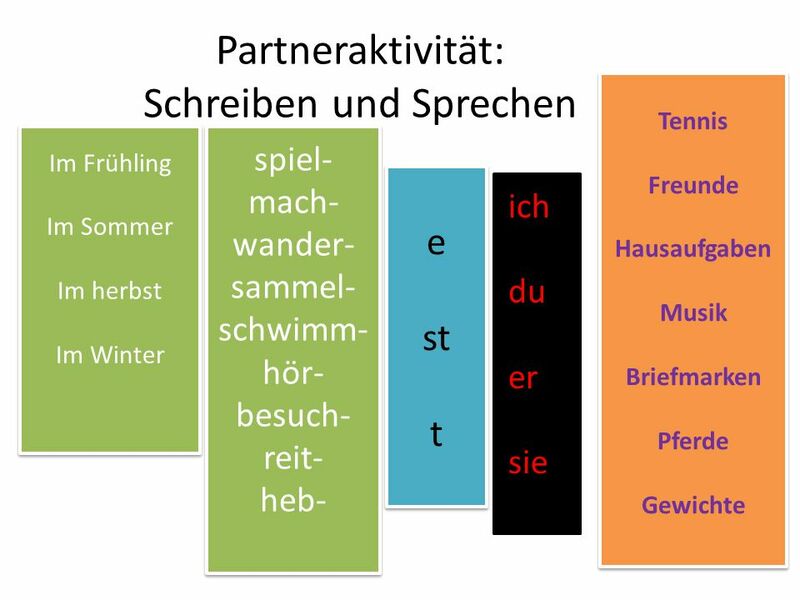 Englisch: In the summer she swims. Shakespeare: In the summer swims she. Deutsch:____________________________________ Englisch: In the winter he visits friends. 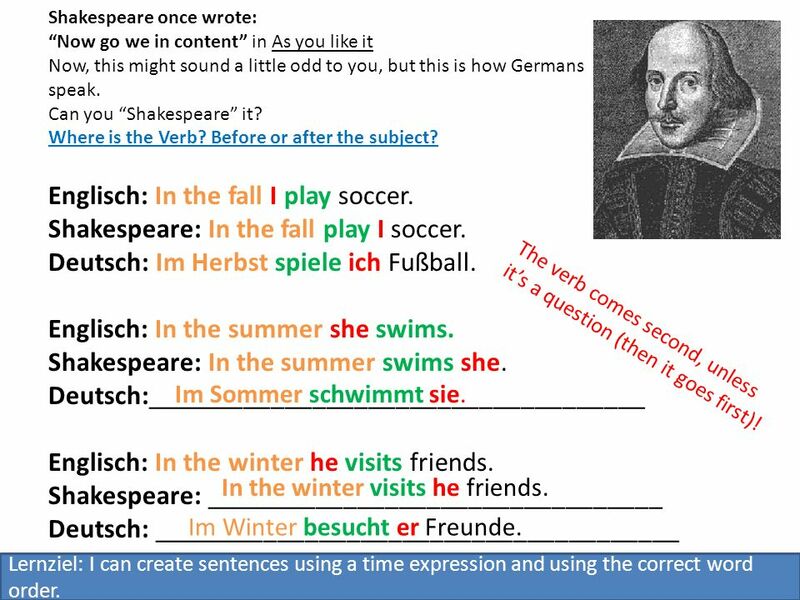 Shakespeare: _________________________________ Deutsch: ______________________________________ The verb comes second, unless it’s a question (then it goes first)! Im Sommer schwimmt sie. In the winter visits he friends. Im Winter besucht er Freunde. Lernziel: I can create sentences using a time expression and using the correct word order. 5 Shakespeare it! Englisch: In the winter I draw. 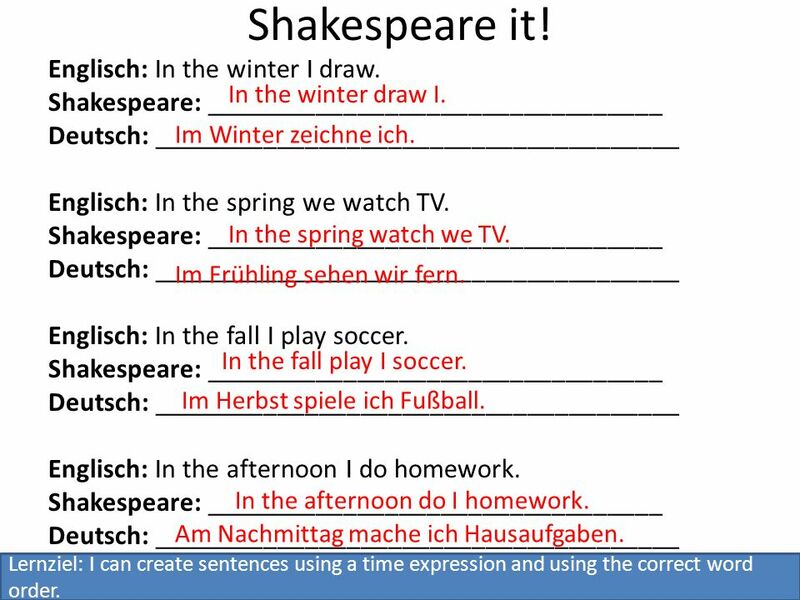 Shakespeare: _________________________________ Deutsch: ______________________________________ Englisch: In the spring we watch TV. 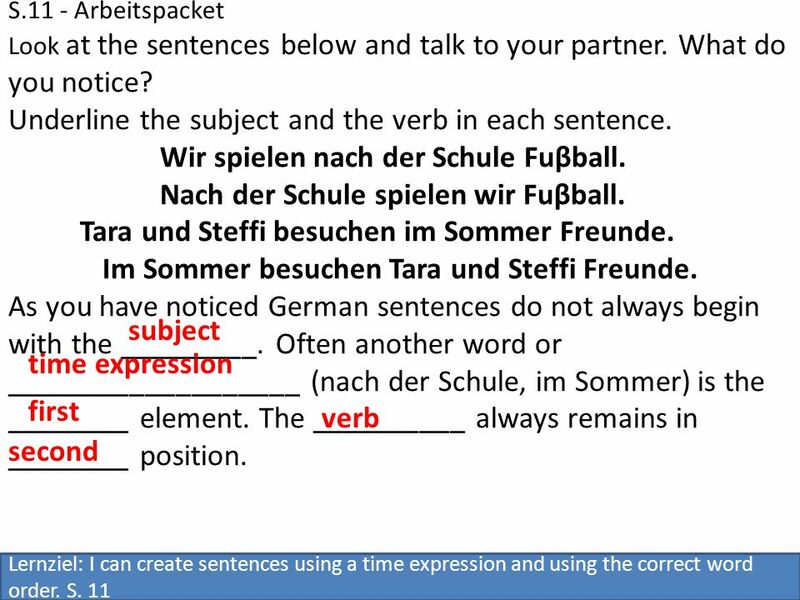 Englisch: In the fall I play soccer. 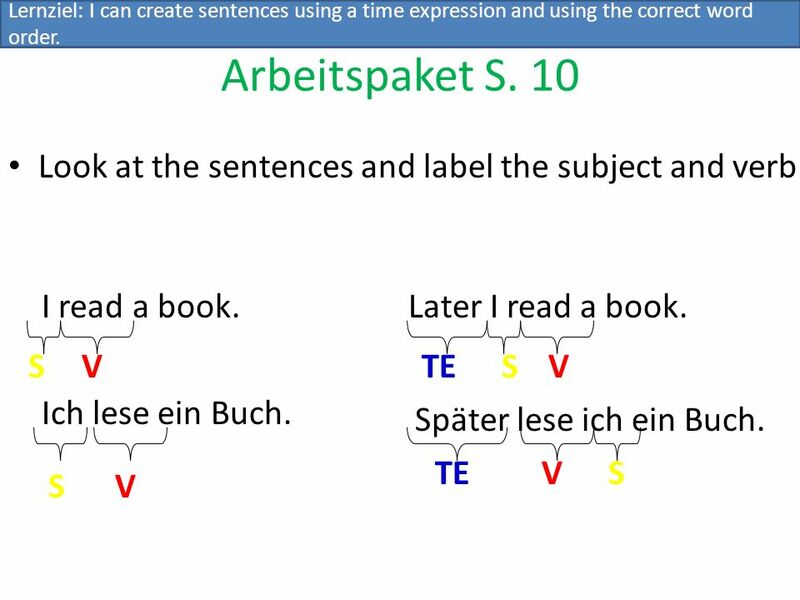 Englisch: In the afternoon I do homework. In the winter draw I. Im Winter zeichne ich. In the spring watch we TV. Im Frühling sehen wir fern. In the fall play I soccer. Im Herbst spiele ich Fußball. In the afternoon do I homework. Am Nachmittag mache ich Hausaufgaben. Lernziel: I can create sentences using a time expression and using the correct word order. 6 Underline the subject and the verb in each sentence. 9 2. Was macht ihr im Sommer? Viel wandern? Lernziel: I can create sentences using a time expression and using the correct word order. 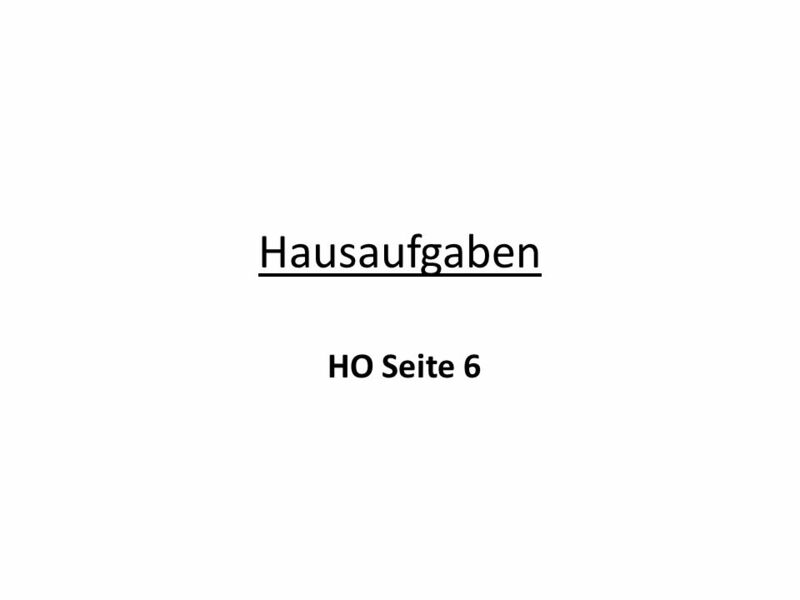 Aufgabe 4 – when are these students doing various activities? Write an answer to each of the following questions, beginning each answer with the underlined part of the question. 1. Was machst du nach der Schule? Freunde besuchen? Ja, 2. Was macht ihr im Sommer? Viel wandern? 3. Was machen Tara und Eva am Nachmittag? Tennis spielen? 4. Was machst du am Abend? Fernsehen schauen? 5. Was macht ihr am Wochenende? Musik hören? 6. Was machen Bob und Ed am Abend? Moped fahren? nach der Schule besuche ich Freunde. im Sommer wandern wir viel. am Nachmittag spielen sie Tennis. am Abend schaue ich Fernsehen. am Wochenende hören wir Musik. am Abend fahren Bob und Ed Moped. 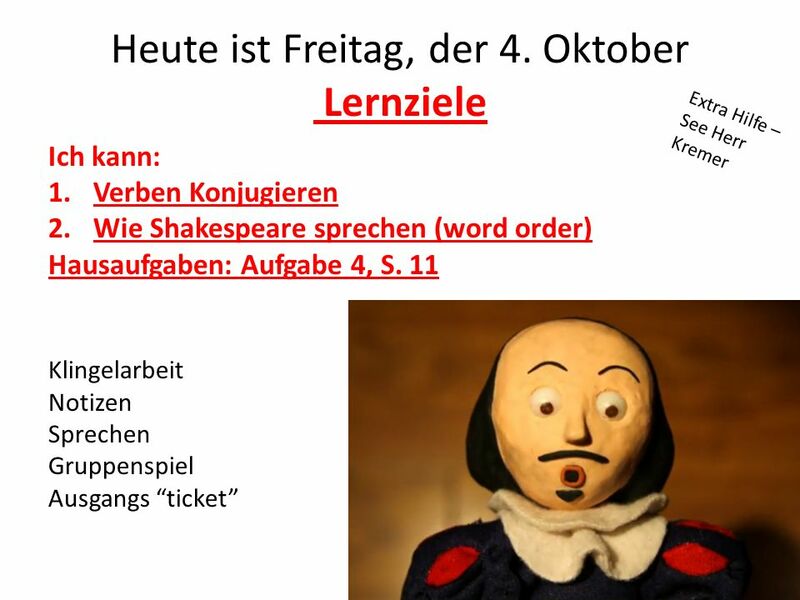 Herunterladen ppt "Klingelarbeit – Translate"
Der Stinger 1. Wohin geh ihr denn? 2. Kenn du das Mädchen da? MODAL VERBS Modal verbs are special verbs (you probably already know them!) and they exist in English and German. can/be able to = können (Ich kann) must/have. Week 9 10/28-11/1. 28.10.13 RMS Glöckner (TRANSLATE & ANSWER!) Wie heisst du? Wie alt bist du? Wie gehts? Woher kommst du? Hausaufgaben Sammelt Briefmarken.